All sinks are furnished with drains in the center of the bowl. 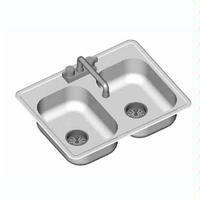 All sinks feature deck-mounted faucet on 4" centers one-compartment sinks with 10" x 14" and 14" x 16" bowls include faucet with gooseneck spout. All sinks feature 3 1/2" -diameter drain holes. Crumb cup strainer assembly with 1 1/2" outlet.